The GlassPasser™ was the first sandblast cabinet designed specifically to meet the needs of the glass etcher. Originally designed by Norm Dobbins in the mid-1980's, it has gone through many stages of development. After Glastar bought Norm's original company in 1989, the GlassPasser™ evolved through a dozen working prototypes with help from Norm and suggestions from many other experienced glass etchers as well. This mid-range cabinet was specifically developed for glass etchers who wanted to be able to etch glass as small as a coffee mug or as large as a commercial storefront window. It will appeal to anyone who wants the ability to etch large pieces of glass without investing the time, space and money in constructing a dedicated blast room. Other cabinets are basically metal boxes made for cleaning paint and rust off small auto parts. 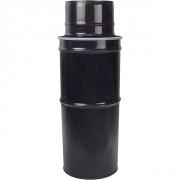 They are not meant for glass, because they severely limit the size of the piece that can be blasted. The cost of these cabinets ranges from $600 to $4000, depending on the size. No matter how large a cabinet you purchase, Murphy's law of glass etching says that your next job will probably be for a piece of glass that is too big for it! Then you are faced with disconnecting the blaster, changing the abrasive, putting on all sorts of expensive and uncomfortable protective gear, and blasting the piece outside (or in a dedicated blast room). You can avoid all this by using the GlassPasser™. It will save you the time and space necessary to construct a full scale blast room. You also have all the advantages of a regular blasting cabinet. The exclusive design of the GlassPasser™ provides slots in the sides and top so that pieces much larger than the cabinet can be "passed through". Only the portion of the glass that is within the cabinet at any one time is blasted. It is very simple to open the slots, and slide the glass through, stopping to close the slots and blast a new area as it enters the cabinet. When the glass is taller than the cabinet, and the lower portion has been blasted, turn it over and slide it through again to finish the other half. In this way, a piece of glass up to 6' (183 cm) X 8' (244 cm) long can be etched. Medium duty system with 100 pound pressure blaster and small dust collector.We prefer to use one of the included brushes and one of the optional gloves. This way, you can put small pieces into the cabinet through the brushes and not have to open the door. The other hand is covered by the glove keeps cleaner, because the abrasive doesn't get all over it while you are blasting. 29 1/2" x 13 1/2"
This equipment system will accomodate over 95% of the people who want to order this cabinet and provides everything else you need at the same time. What's more, ordering one of the suggested systems below will get you in business etching glass the fastest and easiest way possible. To see other pass-through type cabinets, click here. The GlassPasser™ has a large interior space plus adjustable slots on both sides and the top. As shown here, this allows glass larger than the cabinet to be etched. It comes with two magnetic base interior lights and brushes for hand access to the interior. (Brushes provide maximum access to the upper and lower areas of large glass.) Gauntlet style gloves with adapters are optional. Brighter working area; adjustable light position and angle for any type etching. 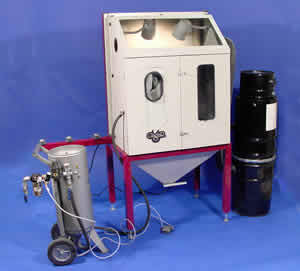 Easy recycling of abrasive into pressure blaster. Easy access to every inch of the cabinet. Cyclone separator or abrasive reclaimer: The separator is for use with the 100 CFM dust collector and the reclaimer is for use with the 300 CFM. Either will save you a lot of money on abrasive by allowing you to recapture and recycle much more abrasive that would normally be lost to the dust collector. They pay for themselves in a matter of months. Gloves: Gauntlet-type fixed to an adapter plate, used in place of brushes. Keeps hand and arms from coming in contact with abrasive. Completely eliminates any abrasive leakage that can come through the brushes. You may want to switch from brushes on large jobs to gloves for small pieces. You can even use one of each for special applications. Convenient Easel: The easel supports glass inside the cabinet while being blasted. It is height adjustable, which allows the glass to be placed at a comfortable level. The easel is lined with plastic to minimize glass scratches and is removable, in order to accommodate the blasting of larger objects. Production system for etching larger pieces of glass. Shown here with a heavy duty 300 CFM dust collector and a 100 pound pressure blaster with air actuated foot pedal.